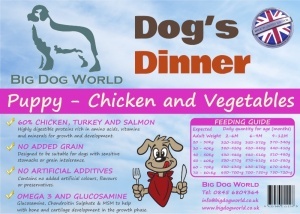 Ultra premium grain-free puppy food from Big Dog World. Dog's Dinner Puppy Food with Chicken, Sweet Potato, Carrots and Peas is a delicious recipe that your puppy is sure to love. 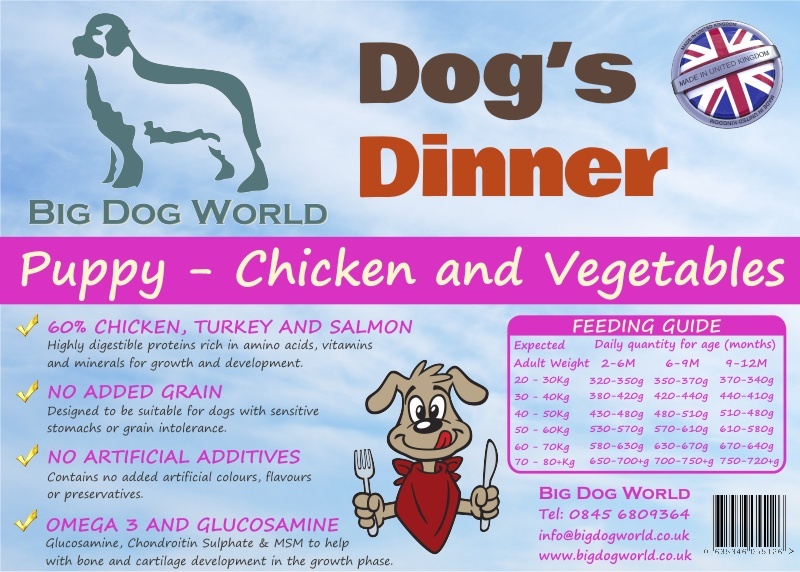 With 60% Chicken, Turkey and Salmon; plus Glucosamine, Chondroitin and Omega-3 for healthy coat and joints. We believe our foods offer the best combination of quality and value of any dog food on sale today. Dog's Dinner is made in the UK and contains no added grain making it suitable for dogs with sensitive digestion or grain allergies. It also has a high meat content with no artificial additives such as colours or preservatives. Suitable for small to medium puppy breeds. Many animal nutitionists believe grain is not part of a dog's natural diet. Their teeth and digestive systems are not suited to breaking down and digesting grains such as maize corn and wheat. Opinions vary on whether dogs are carnivores or omnivores but they clearly possess a natural carnivorous bias. Therefore a diet rich in meat or fish is obviously preferable. Chicken; Turkey & Salmon 60% (including 20% Freshly Prepared Chicken; 14% Dried Chicken; 7% Freshly Prepared Turkey; 7% Freshly Prepared Salmon; 7% Dried Turkey; 3% Dried Salmon & 2% Chicken Stock); Sweet Potato (19%); Potato; Beet Pulp; Omega 3 Supplement; Linseed; Minerals; Vitamins; Carrot (equivalent to 25g per Kg of product); Peas (equivalent to 8.5g per Kg of product); Vegetable Stock; Glucosamine (170 mg/kg); Methylsulfonylmethane (170mg/kg); Chondroitin Sulphate (125mg/kg); Nucleotides; FOS (92mg/kg); MOS (23mg/kg).